Do you run social media marketing campaigns for your company? Wish to improve your productivity every step of the way? In this article, you will learn about 12 tools that can help you to increase your productivity across the five steps of a social media campaign: competitor analysis; objective setting; content creation; community management; and results tracking. These three tools can help you to identify how well your competitors are doing and to benchmark your brand’s performance against them. Offering a suite of different social media analytics, monitoring and management services, SocialBakers helps you to match your social media performance on various indicators against your top competitors. To start, you can try their free social media benchmarking tool, which generates a report that measures various metrics such as audience by country, audience growth, number of interactions on page posts, and your most successful content, in comparison to your competitor’s page. SocialBakers also has a powerful paid version which allows you to track your social media analytics across multiple performance and engagement metrics. 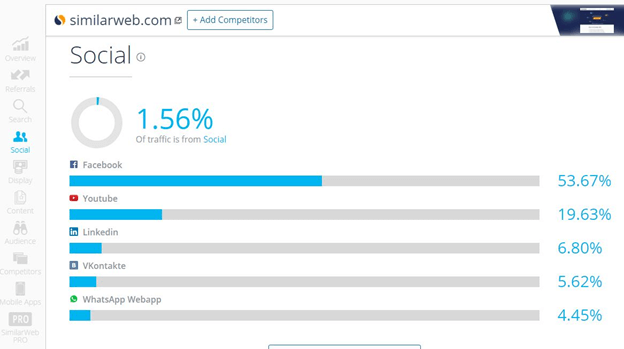 SimilarWeb also offers a suite of analytics tools aimed at website data. Reporting includes estimates on a website’s average visitor traffic and domain statistics comparison. As a social media research tool, you can use SimilarWeb to estimate the volume of traffic coming from different social media sources. This helps you to benchmark your performance against your competitors and to establish the right levels to aim for. Google Alerts sends you an alert whenever your topic, brand or other related keywords are mentioned on the web. It is a great way to keep track of what competitors or influencers are writing about and allows you to monitor the pulse of your content topic. After knowing what your competitive landscape is like, you’ll need to set SMART (Specific; Measurable; Achievable; Realistic; Time-bound) objectives for your campaign using prior performance figures as a benchmark. The great thing about most social networks is that they each come with their own free analytics tool. 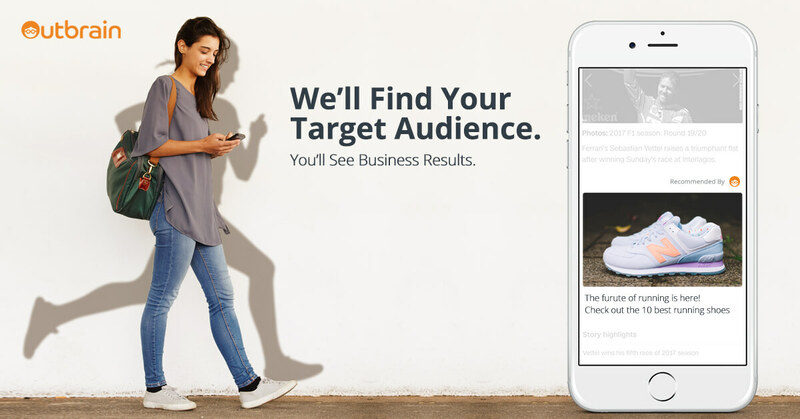 Facebook Insights provides business users with a comprehensive scoreboard which shows you how well your Facebook page performs along multiple metrics. 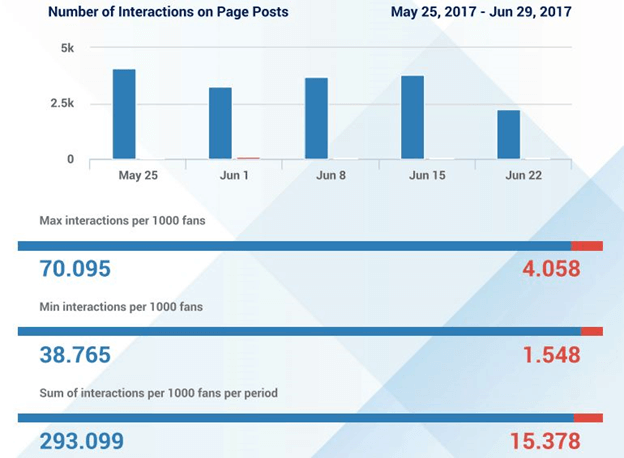 They include useful indicators like Page Views, Page Likes (i.e., fan growth), Reach, Post Engagements, and Video Views. What’s great about Facebook Insights is that it shows you how well your Facebook content is performing relative to the corresponding last period using the benchmark feature. This should guide you to either continue doing what you are doing or tweak your content to improve engagement. You can drill down even further by analyzing each individual post. The report includes average reach and average engagement (post clicks or reactions, comments, and shares). This provides a useful benchmark on how well different content types performed and what post type you should focus on. Beyond establishing the performance of your social media content, you should also define your customer journey. Canvanizer is a free mapping software that allows you to create a Customer Journey Canvas using color-coded stages of your buyer’s journey and include the different content touch points in your plans. Canva is an online graphic design tool which features a drag-and-drop interface that allows you to easily create professional looking images and infographics for your blog or social media platforms. Canva offers design templates, pre-determined image sizes to suit different platforms, a gallery of free images and vectors and also allows you to upload your own images. Need keyword ideas to make your blog post score better on search engines? LSIGraph is a free keyword generator that helps you to formulate long-tail keywords that are semantically linked to your search keyword on Google. LSI stands for Latent Semantic Indexing, which is a method used to come up with synonyms that are related to your main keyword. This helps you to avoid keyword stuffing in your blogs – a practice which is frowned upon by Google. Beyond this, the tool also offers you an e-book to help you use the keywords to formulate content ideas. Word2CleanHTML is a simple but handy tool that does exactly what its name says – convert word documents into clean HTML for easy web transfer. This can be a great help if you blog regularly and prefer to do your drafts on a Word document. It is especially useful for longer pieces of content and can help to shorten your production schedule. HootSuite is a powerful tool considered by some to be the “Swiss Army Knife” of social media tools. It provides a whole host of functions – from publishing and scheduling of Facebook, Twitter, LinkedIn, Instagram and other posts, responding and liking comments, to determining the best timings to engage your social media communities. What’s really neat about HootSuite is that you are able to schedule your posts in advance. You can even time it for specific peak periods using their Autoschedule function. If HootSuite’s interface overwhelms you, consider using Buffer instead. Like HootSuite, Buffer allows you to schedule your posts in advance. The free version allows you to select up to three social media networks and to front-load your posts. You can also schedule fixed timings for your posts which can help you to optimize your publishing times to match audience traffic. Apart from being simpler to use, Buffer also features post analytics like the number of likes, comments, shares and click on each post. The best tool to track your campaign results is Google Analytics. This 800-pound gorilla tracks almost everything you need to know about your audiences (demographics, interests and location), traffic sources, user flow, and conversions. 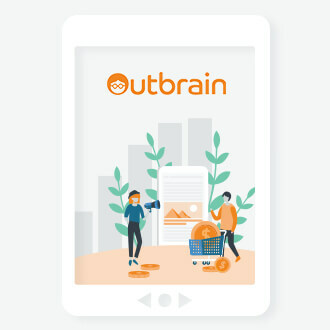 Furthermore you are able to compare against different traffic sources, breakdown the traffic coming from different social media channels and even find out the time each visitor spent on the site and the number of pages they viewed. What if you need to track where specific traffic sources are coming from? 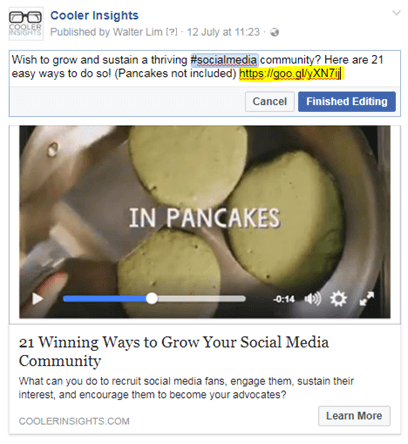 Consider using Google Campaign URL Builder. The great thing about this tool is that it allows you to determine which social media channel performs best when it comes to driving traffic to a specific landing page on your website. Adopting the five-step approach to social media marketing helps you to plan and execute campaigns in a more systematic fashion. 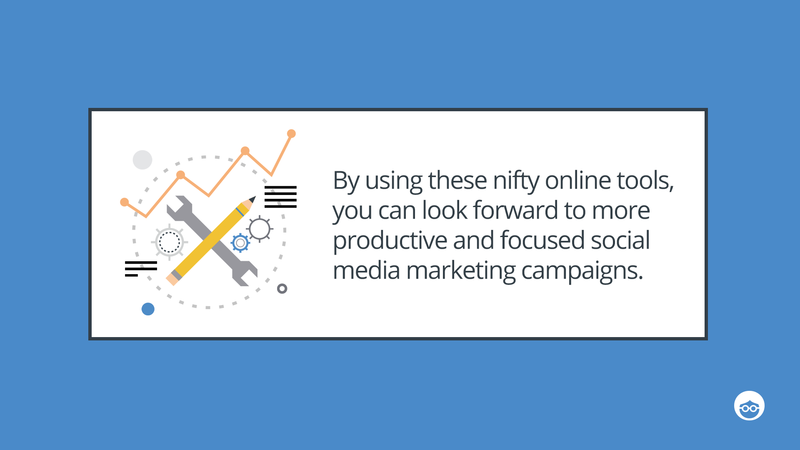 By using these nifty online tools, you can look forward to more productive and focused social media marketing campaigns, with improved targeting, content creation, community management and performance measurement. 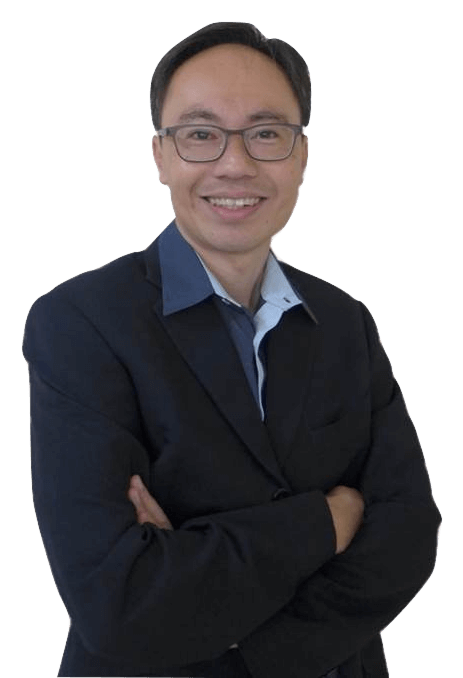 Walter Lim is a social media marketer, brand storyteller, digital geek, and trainer. Founder of Cooler Insights, he loves to help businesses create, nurture and grow winning brands through storytelling, content marketing, social media, and PR.